Are you fed up with the low internal storage of your android device? Well, fret no more. In this post i will be sharing some simple tips that can definitely boost your low internal space to a few more megabytes, if not gigabytes! P.S: If you have a phone without an SD card support, then unfortunately most of these tips won’t work. Why is the internal storage so important to save? All the data associated with your contacts, messages, emails, settings and several other important apps is stored on the internal storage of your android device. So, having a low internal storage can create potential problems like – having trouble installing more apps, trouble receiving messages/e-mails from your friends, adding new contacts, etc…Further, the fact that you can’t buy more internal memory, unlike a regular SD card, makes it even more important to save. How to boost your phone’s internal storage ? One obvious way to increase the internal memory is by uninstalling all those “unnecessary apps” that came pre-installed on your phone. Make sure that you DO NOT uninstall vital system apps or else you may end up messing up badly with your phone! Uninstall only those system apps that you do not need and without which your phone can continue to run smoothly. Please Note: Looks like some of my readers are doing some crazy things with their system apps like uninstalling stock home launcher(without any 3rd party launcher installed), moving all system apps to SD card, freezing crucial system apps and so on, which is causing them big trouble. Please please please, don’t do such stupid things. If you still wish to experiment with your phone, please consider taking a NANDROID BACKUP first, before touching any system app on your device. This way you can easily revert back to your stock ROM just in case things start getting out of control! For this you have to root your android device. Rooting your android device is must, if you wish to remove all those unnecessary system apps. These days almost every phone model can be rooted easily. Do a quick Google search : your phone model + root. Rooting has its own advantages and disadvantages. Advantages – With a rooted device you can unleash the full potential of your android device. You can easily uninstall all crapware (unnecessary system apps), widgets, overclock your device and can even take the complete backup of your whole android system in just a matter of few minutes. Disadvantages – You are voiding your manufacturer’s warranty. If somehow(although rarely) your phone gets damaged, then the manufacturer won’t repair the phone. Don’t get scared..It’s a rare situation. Rooting has became a necessity for almost every android phone owner these days. Whenever you surf the internet, download market applications and run various internet based apps, a history and cache log is created on your phone’s internal storage. 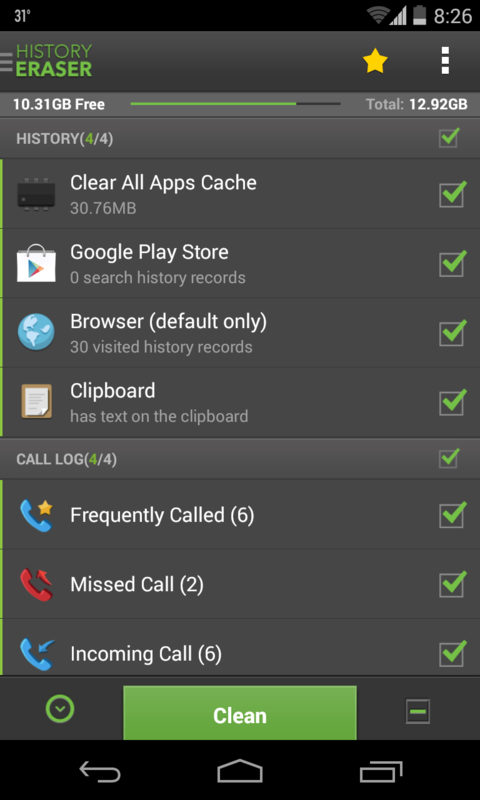 Download History Eraser app from the play store and bid goodbye to all the history and cache with just a single tap! There are some apps which are not installed on SD card by default. You need to move them to SD card manually by going through manage application settings. This manual operation can be tedious and time consuming. Use App2SD and automate the whole process! There are some apps(like launcher, antivirus, office, etc.) which cannot be moved to SD card because the app-developer has disabled that option. To force move them to SD card, you will again need to have root access on your device. Titanium backup and Link2Sd are the two powerful apps that can accomplish this task very easily. option e) Using some portion of your SD card as internal storage (requires Root) – THE BEST METHOD TO GET RID OF LOW INTERNAL STORAGE PROBLEMS! How if you could spare 1GB of your SD card’s storage space for the internal memory? Sounds great, right? I found this method on the xperia blog and it worked like a charm on my old wildfire S (with 1GB of internal storage now :P). The basic idea is to first partition your SD card into two parts (depending upon its size). The primary partition is for your multimedia requirements and the secondary partition is for creating an artificial internal storage. Click here to follow the entire tutorial on the xperia blog. If you are already rooted and you don’t have an xperia phone, skip the steps 1 and 2 and proceed ahead. Best of luck! Hi Abhishek, hope you are doing well, I am very happy about your way of information sharing. Thanks a lot. I have a issue with my new cell(android 4.4.2) can’t access my internal memory in pc. Please help. Thank you. Hi Anwar. Thanks for your comment. You can access your phone’s internal storage through ES file explorer app. In the app, swipe left for navigation menu and there you can find “/ Device” in Local section. That’s your internal storage. I had internal memory 11.49 gb total 5 gb used(obviously 6.49 gb free) in sony xperia z1 compact , i unlocked the bootloader with .242 build version and now i want to upgrade to .272 build version. 1) if i upgrade the firmware, will my internal memory increases or decreases? 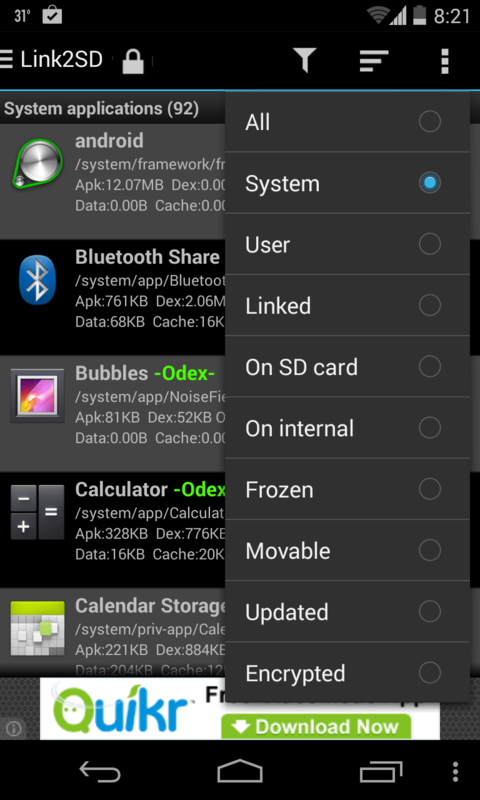 2) If i flash the selected custom rom then will it increases or decreases my internal memory? 3) is it the process of flashing custom rom like formatting and rebooting another operating system in computers? History eraser shows you what it cleans and what it doesn’t clean. No, it won’t clear your account. Pls help me to root my Sony xperia E1. show me every step of the process. Hi Anand, did you try searching Google? yes I got an answer from http://blog.flexispy.com/root-sony-xperia-e1/ But i am not sure whether it is right method or not. Pls help me to find a right method to root. I understand your concern. Since you’re new to rooting, I do not recommend you to root your device manually, since this involves too many technicalities which may intimidate you. Try rooting your xperia E1 using pre-coded software programs. Kingoroot app may work for your device (I’ve seen that they support Xperia E series). can you help me i have a myphone android kitkat 4.4.2 and my internal storage is 112 mb is rooting helpfull? Hi, i got a new android with 16gb internal storage.I have been suggested to store apps in SD card as the phone may hang otherwise.Is it true?Are there other disadvantages to store apps in phone? Mansi, Yes, if you’ve got a SD card then please move the apps to the external storage. The phone’s internal storage is vital to preserve because this is the space where all your messages, emails and other important app data is stored. My phone was 3 kinds of storage. External SD, internal memory, And internal “SD”. The last one works as an sd but it’s actually just a partition from the internal memory. Can i get rid or reduce the internal sd and transfer it to the internal memory?. Hi. Can you please show me a screenshot of your storage space? I have a lg optimus l70 on metro pcs, i wish it had 4gb internal memory. It said a little over 1gb after initial activation. I have not rooted the phone yet if it makes any difference. How can I root my Samsung Replenish?????? Actually I’m seeking the solution via XDA too unfortunately all the options I received needed debugging the phone, since I can’t access settings I can’t enable debugging! What exactly is flashing of Stock Rom & how do I do it! I’m trying with the local service experts too, let’s see if they are able to do anything. Is there any way or possibility of re-installing the android OS like the formatting & re-installing windows that we do on our PCs. By the way, have you tried flashing any launcher app via recovery (must be in flashable zip format)? This might solve your problem. Thanks for your prompt response but it did not work. The adbdriverinstaller could not find the device, althought it was connected to PC & the sd card was accessible only via PC. This may be probaly because I’m not able to enable the debugging mode as I’m not getting any menu or settings buttons on the screen. Any further advice ideas are most welcome. 5. Nothing works? Buy a new phone! And next time don’t ever forget to take a ‘nandroid backup’ of your stock ROM. All the best! I have accidently uninstalled the Home launcher app of my Android 2.2 mobile (Chinese H3000 model); as a result it is not going beyond the screen saver at, the screen just turns blank with no widgets/shortcuts/buttons appearing at all! Although it rings & receives calls when called. I have already tried factory reset option. That’s all! The apk will be installed on your phone. Tap on the home button and you will see your new launcher in action. Thanks for visiting Budding Geek! I use the link2sd app and crashes my phone, it nowhere restarted and the apps that i had move to sd card, doesn’t work now! What percent data moves or linked to sd partition because as i wrote earlier that all the applications are linked to sd but still internal memory is low. I have an atrix 4g with 16gb Internal Storage. But it allots around 310mb for system. I am running short of system storage. The phone is rooted. I am running MIUI ROM configured for Atrix 4g. Is there any way I can increase this System Partition. Is there any such app or trick / method to do so ? Did you perform any sort of partition on your device? hey i want to buy karbonn a6 but it says just 104mb of inbuilt memory should i buy it. or reccomend me another between rs.3,000-5,000 i am also a android user. Rather than uninstalling unnecessary apps, could it be possible to enlarge a Galaxy Y’s Internal Memory? If yes, where? How? I don’t have any idea at all. Please help me. When i try to uninstal an unuseful system app, it sais that there’s an error and that Link2SD can’t get root access. then it sais that i have to make sure that i answer ‘allow’ when Superuser asks for it. but it has never asked for it..
Open the superuser app and see if link2sd is listed in the apps list..If it’s there, tap on it and check the status – it must be Allowed. If it’s denied, click on the half broken android icon on the bottom left screen to toggle its state. i cant even download the link2sd, because i have too less memory, but i have 17 mb left.. There are some apps for which developers choose not to provide an option to move them to SD card..In that case, you will need to root your phone and use link2SD to force move them to your SD card. Got it? I have a Samsung s duos too. There is no option to move apps to SD, for any application. I tried the app to sd app from Google play, and that didn’t help either. Did App2SD give an error while trying to move apps to SD card? What happened exactly? i hv moto fire xt311 with an intrnal memory of 156 mb….when i opened my phone for the first time frm then only the internal memory is below 20mb persistently…i want to know that is rooting neccesary or there is some other thing tooo??? i have now my phone succesfully rooted. Abhishek Raj , thanks for sharing us your knowledge about rotting android phone…..
Hey i have an android lgl35gstraight talk phone and i have no idea how to root my phone!?? I understood the whole linksd thing but not the root part!! How do i root it??? I really need help ASAP!! Sandeep, regarding your 1st query – go to http://helpx.adobe.com/flash-player/kb/archived-flash-player-versions.html and download the appropriate apk file for your android version. Copy that apk file to your SD card and try installing it with any file explorer app. Still no luck? Try contacting your phone’s manufacturer. Regarding your 2nd query – replace your stock launcher with a third-party launcher app like go-launcher, which provides an option to customize the size of home-screen icons. Thanks Abhishek for your response. For the first query, is there any alternative to Adope flash player which can be installed in my handset. the handset is of gingerbread and is a China make. For the second query, I shall down load the third party go launcher app to increase my desktop icons. If Sony has released an ICS update, then you can easily upgrade your device. I don’t have Xperia, but i guess the software-update option should there under phone settings. Good luck! can u help me with my sony xperia neo v???????? i have sony xperia s…i want to upgrade my internal storage..how can i upgrade it?? I have very limited phone memory on my Galaxy fit. Will rooting my phone give me more space ? Rooting your android will grant you administrative privileges, so that you can delete all those unnecessary stock apps that came pre-installed on your phone and are occupying a considerable portion of your internal storage…and to uninstall all such apps, you will have to install Link2SD OR Titanium backup (both of which require root access) So, definitely, rooting your phone will help you save some extra space!